A traditional three bedroom semi detached family home, situated on the outskirts of the popular village of Heage and within a short commute to Belper. 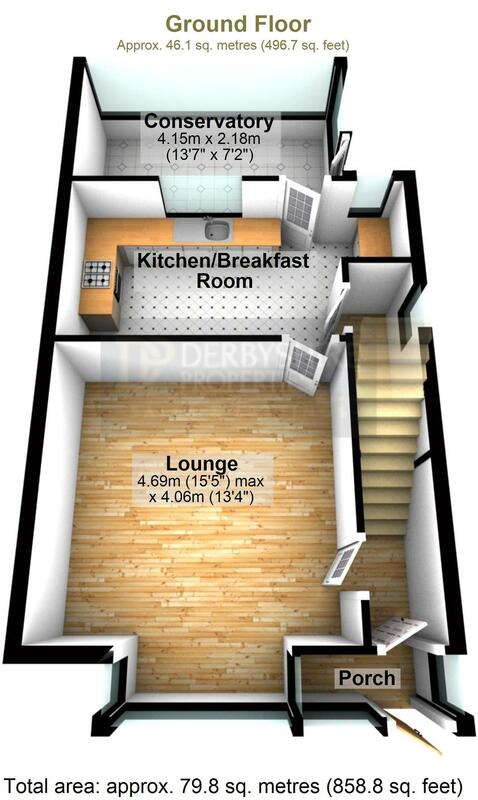 Having modern dining fitted kitchen, lounge with multi fuel stove and conservatory. To the first floor there are three bedrooms and a family bathroom. The property has the benefit of uPVC double glazed windows and doors and a modern gas combination central heating system, off road parking to the front and an enclosed garden to the rear with open countryside views. Good commuter links to the A38, M1 and Belper railway station all nearby. Suitable for First Time buyers/Growing Family and Investors. Viewing Recommended - Draft Details Awaiting Vendor Approval. Heage is a small village situated on the outskirts of Belper, there are a few amenities within the immediate area of the property. The main shopping towns would be either Belper or Ripley where there is a large choice of supermarkets, leisure complex, weekend market, hospitals, cinema and good commuter links to the A38, M1 and railway. From the Agent's office on Bridge Street proceed towards the Morrisons roundabout and turn left up New Road. On passing the Market Place take the left fork onto Chesterfield Road, after some distance bear left along Far Laund and then straight on into Jacksons Lane. At the T-Junction turn left and then first right into Park Road, continue onto Parkside where the property will be identified on the right hand side identified by our 'For Sale' sign. The property is approached via a uPVC entrance door and glazed panels opening into the entrance porch onto door opening into the hallway. With a central heating radiator, stairs rising to the first floor and doorway to lounge. 15' 6" x 13' 4" (4.72m x 4.06m) measured into the bay, with a feature multi-fuel stove set on a stone heath with stone mantel and surround, decorative coving to the ceiling, two central heating radiators, television point, telephone point and door to dining kitchen. 17' x 8' 6" (5.18m x 2.59m) at the widest points, with ceramic tiled floor, spotlighting to the ceiling, uPVC double glazed window to the rear elevation, uPVC double glazed door opening to conservatory, wall and base units with drawer storage in a cherry effect door finish, wine rack, modern square edge work surface over, inset stainless steel sink and drainer with chrome effect mixer tap, built-in stainless steel fan assisted oven and electric hob, chimney style extractor over, complementary wall tiling, space for utility with work surface over with wall mounted Ideal Logic combination boiler above, space and plumbing for washing machine, cupboard storage off kitchen and uPVC double glazed window with privacy glass to the side elevation. 13' 7" x 7' 1" (4.14m x 2.16m) with a central heating radiator, uPVC double glazed doors and windows to the rear and side elevations, ceramic tiled floor and central heating radiator. 13' x 10' (3.96m x 3.05m) with a double glazed window to the front elevation and central heating radiator. 10' 6" x 8' 9" (3.20m x 2.67m) with a central heating radiator and double glazed window to the rear elevation with views over open countryside. 6' 7" x 9' 10" (2.01m x 3.00m) at widest point, with a double glazed window to the front elevation, central heating radiator and built-in open storage. 6' x 5' 5" (1.83m x 1.65m) Fitted with a white three piece suite comprising a panelled bath with separate hot and cold taps and electric shower over, pedestal wash hand basin with separate hot and cold taps, low flush WC, complementary ceramic wall tiling, chrome effect ladder style central heating radiator, double glazed window with privacy glass to the rear elevation an spotlights to the ceiling. At the front of the property is a pull-on driveway with a low maintenance garden with gravel area, walled frontage and side path leading to the rear. At the rear of the property is an extended patio area which continues onto the lawn with vegetable plot beyond and all enclosed with fencing and walling to the perimeter and a further separate brick built store shed.